Thought becoming flesh, transformative practices mediated through the body. Performance is embodied writing manifested through a symbiosis of mind and corporeal body within space. A creative simultaneity of idea and active being, sited in the living present, performance inscribes the body in the multiple possibilities of the future. The Island from Kayla Parker on Vimeo. Contemporary Performance Network defines contemporary performance as a term “used to describe hybrid performance works and artists that travel between the fields of Experimental Theatre & Dance, Video Art, Visual Art, Music Composition and Performance Art without adhering to one specific field’s practice” (2011). Marina Abramović: “For me, performance is when the performer steps into his own mental and physical construction in the public. It’s a kind of energy dialogue. They are not rehearsed or repeated but done once basically. There is a concept that is a platform for the performer to follow, but at the same time, he doesn’t know the outcome of the performance in that moment. It is very different from the theater. There is a constant dialogue between the performer and the public.” In an interview with Pitchaya Sudbanthad, Museo magazine (1998). “Until the moment of performing the ideas had no physical form and I could only hope that I could bring them to life and do justice to them. The various aspects I thought about and which mattered to me were very much to do with the nature of the space, the way the light fell and how people would come in or get from one place to another. 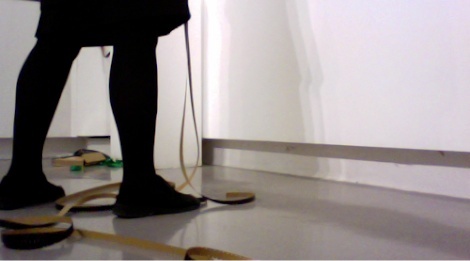 Ideas would come from the space itself and would become part of the work.” Annabel Nicolson’s response to ‘Parameters of practice - Annabel Nicolson’s 1970s practice’, presented by Patti Gaal-Holmes at Narrative exploration in expanded cinema seminar, St Martins, London (2009). This section also contains info about my performance work whilst a BA fine art student at Newport School of Art and Design from 1982 to 1985. At the start of the course I signed up to do a performance art workshop with Richard Layzell, then a visiting lecturer at Newport. I think my choice was influenced by the increasing importance of the body and temporality in my work, and going to IOU Theatre’s Musical Meal at Chapter in Cardiff in the summer of 82. Going back further to when I was a kid in Cyprus, I remember watching my mum on stage at a dress rehearsal, from the darkness at the back of the theatre hall in Berengaria, and seeing Greek plays in Curium (Κούριον) amphitheatre - maybe that had something to do with it too. I’ve also included collaborative work with Dark Bananas, the feminist performance and video art group, co-founded with fellow Newport students Pamela Cole, Nicole T Murray, and Jane Simmonds. Titles appear in reverse chronological order in the sidebar on the right: ie the most recent work is at the top.